Facebook CEO Mark Zuckerberg Quit his job at Facebook. Yes you heard it right. You can check it . Click here to see the Facebook post of Mark Zuckerberg about quiting his job. Don’t be surprised or shocked, because what you just saw was only an illusion. This is actually a minor bug in the popular social media website that allows anyone to manipulate the life event of any user who has his work status posted on Facebook. The bug, uncovered by the independent hacker Sachin Thakuri, is not a technical flaw. 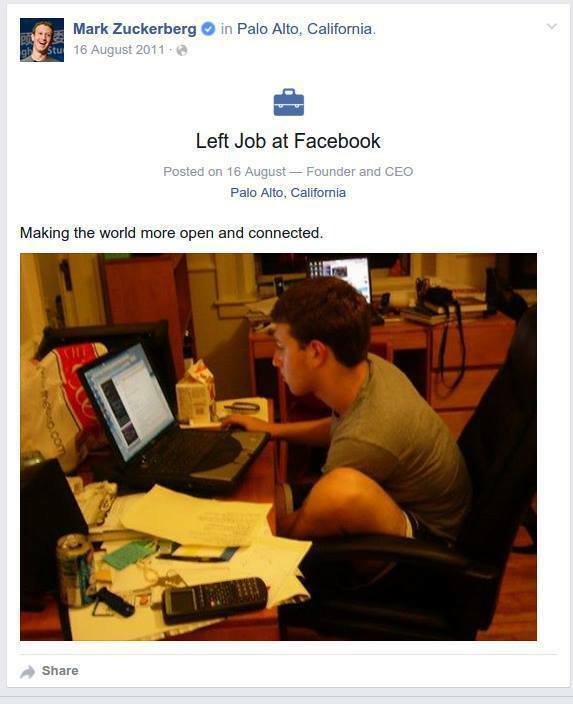 Clicking on the above manipulated URL displays the same life event page of Mark Zuckerberg but with the text: Left Job at Facebook instead displaying Started Working at Facebook. This bug is applicable to every user on Facebook who has his work status published on Facebook. Although this is not a serious privacy or security bug, but it could be used maliciously by bad actors in order to trick victims into believing that someone have quit their job.Thakuri reported this bug to the Facebook security team, but the bug has not been fixed as of yet. So, we can expect from the company to fix this issue as soon as possible.